Silvio Rizzi had a damn good day. Not only did the Swiss creator of Reeder, the must-have Google Reader, um, reader for iOS, pushed out version 2.2 for iPhone, adding Facebook integration and a one-swipe gesture to send an article to Instapaper, but he also released Reeder for Mac Draft 1, a beta but still extremely polished RSS for everyone’s favorite non-touch OS. I’ve been using it for the past several hours, and I can confirm that it’s the perfect desktop companion to on the go RSS-ing — I’m never popping open Google Reader in a browser ever again. As you can see from the screenshot above, it’s very clean, evoking the look of the iPhone and iPad versions, but with an interface well-suited to the comfy confines of OS X. Specifically, there are a few simple drop-down menus for the cursor-inclined, as well as keyboard shortcuts. Lots and lots of keyboard shortcuts. It’s actually possible to refresh, browse, read, switch folders and mark everything as read without so much as touching a mouse or trackpad, if that’s your preference. More than anything, it just feels right, a really interesting OS X aesthetic for the post-iOS era, much as Lion was described during the Back to the Mac event. The big buttons could be tapped with a finger, but they’re actually very careful to be the same scale as the Apple Menu icon or any menu bar widget. Rizzi has said he would be interested in selling Reeder through the Mac App Store, and Apple could hardly ask for a better early entrant — this is the kind of superior UI the next-generation Mac deserves: elegant, clean, optimized for trackpad and keyboard, but free of legacy thinking from when the Mac’s original interface was created. That said, this is very much a beta (or just barely post-alpha) release, so not everything is ironed out fully. There’s no feed management, search, or downloads yet, and there are a few confusing elements. For example, if you open an article in the original web page, to return to your feed index, you either need to click an easy-to-miss X button in the upper left of the browser window, or hit shift-cmd-W. Hitting cmd-W closes the entire Reeder window, and it can’t relaunch without a restart — why allow closing the full window at all? Also, the look is a bit too minimalist in spots, the column of icons down the left edge represents folders and individual feeds (if any) not in folders. The use of four prominent logos from within is clever, but I can only identify which folder is which on my system based on their order, which I’ve memorized. At least showing names upon mouseover or selection would be a nice gesture toward those of us without perfect memories. But still, this is a knock-out, one of the most delightful Mac apps I’ve tried in awhile. Can’t wait until it gets a bit more seasoning. 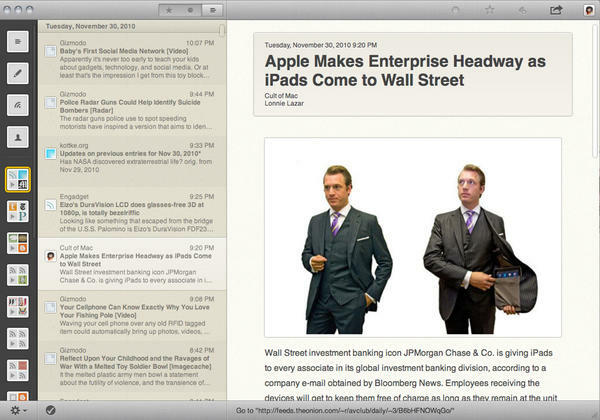 Reeder for Mac Draft 1 is a free public beta and is available from the developer’s website. No word on which versions of OS X it supports, and I tested it on Snow Leopard on a 2008 13.3″ aluminum MacBook. It was zippy It’s only available off the Internet, but maybe he’ll mail you a 3.5″ floppy if you ask nicely.